Baker Cheese is a staple in the Wisconsin cheese industry, known for creating mozzarella string cheese following a tradition of exceptional quality over the last 100 years. We are proud to support the cheese industry in the state of Wisconsin and to work alongside other skilled cheesemakers from across the state to promote the industry. As such, our team at Baker cheese is humbled by the recent news that we swept the string cheese product category at the 2017 Wisconsin State Fair. Baker Cheese cheesemakers, Dan Schwind, Larry Brown and Tim Entringer took first, second and third place respectively. In addition to the product sweep in the string cheese category, Baker Cheese was also awarded third place in the Flavored Pepper Cheese category. This is an exceptional award for Baker Cheese, proving that the quality and flavor profile of our string cheese matches the top artisan specialty cheeses from across the state of Wisconsin. When Baker Cheese began in 1916, every step of the cheesemaking process was labor intensive. The addition of fresh locally sourced milk and cultures to open cheese vats, manually stirring and separating the curd, and extrusion and packaging were done by hand. Jump ahead 100 years and the process steps are essentially the same -- if you add in a little more automation and our state-of-the-art manufacturing facilities. Over the years, Baker Cheese has stayed true to its artisanal roots, blending historical cheesemaking knowledge with modern technology in a way that has allowed the original taste of Baker mozzarella to shine through. Our jalapeno string cheese variety is a testament to our focus on the artisan quality of our cheesemaking. Jalapeno string cheese combines the freshest local milk, diced jalapeno peppers and our all-natural string cheesemaking process. Baker Cheese jalapeno cheese has been highly awarded since its initial launch in 2016. Interested in trying our award winning jalapeno cheese? Just visit our cheese store or contact us now about private label opportunities. What is the real difference between string cheese and mozzarella cheese? 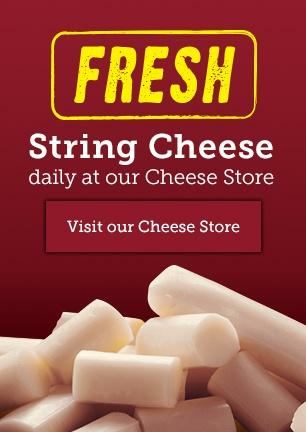 Taste our award-winning, fresh string cheese by visiting the Baker Cheese Country Cheese Store, today! Baker Cheese is a fourth generation, family-owned, string cheese manufacturer located in St. Cloud, Wisconsin. Through generations of innovation, we have maintained the key elements to create truly exceptional, award winning natural string cheese. If you are interested in purchasing Baker Cheese products, visit our Cheese Store page, or contact us to learn about our private label opportunities and learn more about the benefits of being a part of the Baker Cheese family, where quality is our family tradition. © 2015 Baker Cheese, Inc. All Rights Reserved.